Black Bean Deli has been around for a long time now. They always win awards for the best Cuban food in the Orlando area, but I didn't get a chance to eat there until the past year or so. Since then, I've returned several times to their Orlando location on 50. I had the Ropa Vieja lunch special on one visit. 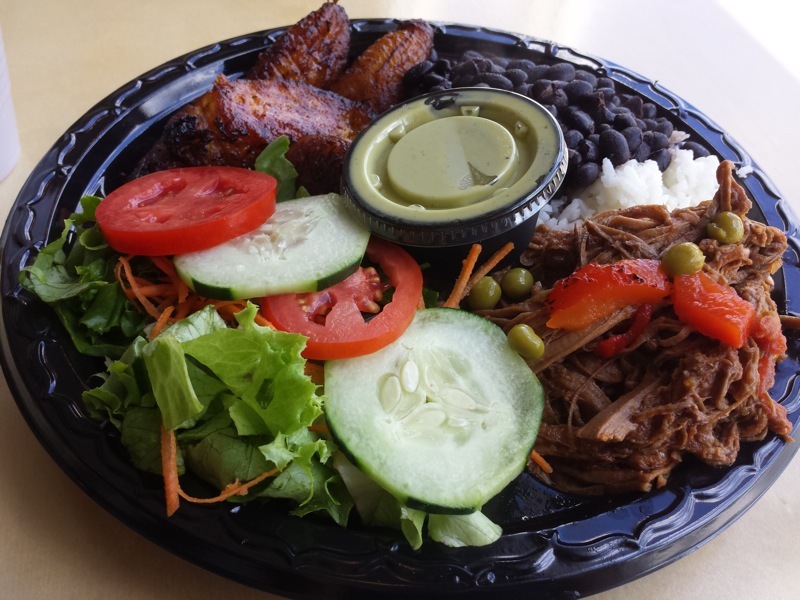 Tender, stewed, and shredded beef was served alongside black beans, rice, plantains, and a salad. I was surprised when I got the plate of food. Many of my previous experiences with Cuban restaurants involved mostly tasty food, but poor presentation. To me, this plate of food was very visually appealing. Everything was delicious, so that made it even better! During another visit, I had the Papas Rellenas Platter. 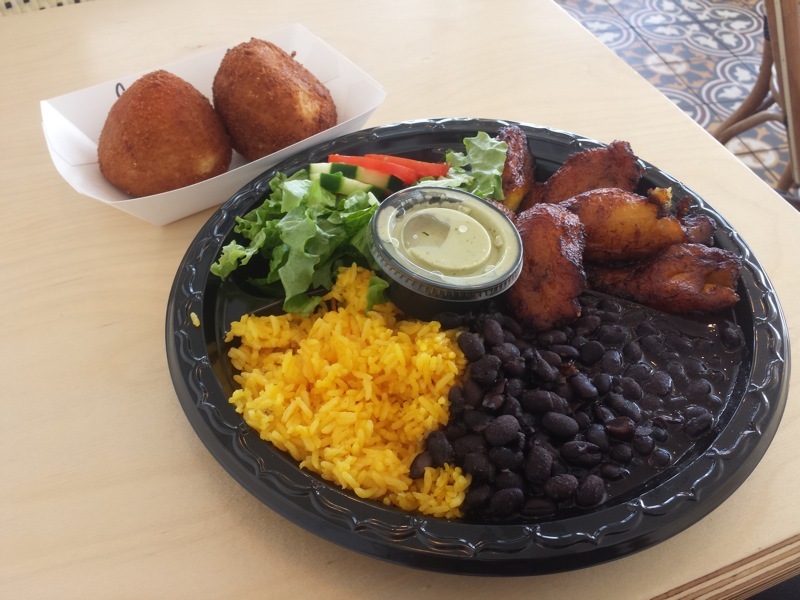 This included all of the same sides as the Ropa Vieja, but the meat was replaced with two deep fried mashed potato balls. I had one filled with beef and the other with chicken. I don't think I've ever eaten papas rellenas before. I became a fan! 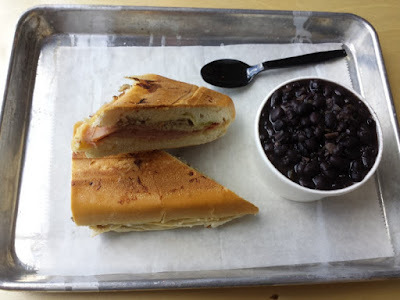 I also have tried Black Bean Deli's Cuban Sandwich lunch which includes the sandwich and black beans and rice. It was a typical Cuban Sandwich filled with meat, cheese, pickles, and mustard. Cuban sandwiches are always a little disappointing for me, and this was no exception. I always have the expectations that they should be more than they are. I ventured out to Busch Gardens to check out their Food & Wine Festival. This was my first time going to the park during this event, so I really didn't know what to expect. They had 26 booths set up in the back section of the park, mostly under the ruins of Gwazi. You could have bought everything individually, but I went with the package where you got a punch card to try multiple food options. The first thing I tried was the Venison Chili from the booth called Southern Station. The Food & Wine booklet described this as Venison Chili featuring roasted corn, black beans, and lime sour cream. Pretty tasty, although it was hard to taste the ground venison once in chili form. Up next was the Potato and Goat Cheese Tart from the Light Fare Canteen booth. This one sounded good, but the goat cheese flavor wasn't prevalent enough. Duck Tacos came from the Chef's Plantation booth. I think this might have been my favorites of the food I tried. The shredded duck was nice and tender, served in tortillas with cabbage and duck sauce. I tried the Smoked Beef Brisket from the Gourmet Lodge Booth. It was served with Potatoes Au Gratin. The brisket seemed to be the same meat that is served elsewhere in the park at Zambia Smokehouse. I'm a fan of the brisket at Busch Gardens, so that's a good thing. Potatoes au gratin were disappointing though. Very bland tasting. Lamb Chop topped with Tzatziki served with tabouleh came from the Field House Eatery Booth. Two pieces of on-bone lamb were placed over the tabouleh. The lamb was a little chewy, but had nice flavor. Finally, I ended with the Pan-Seared Creole Shrimp with white corn artisan grits from the Artisan Eats booth. The two large shrimp were topped with some sort of salsa and greens. Can't go wrong with shrimp and grits. I tried a new Mexican restaurant on Mills in Orlando called Black Rooster Taqueria. This was a quick service type place where you ordered at a counter, given a number, and had the food delivered to your table. I ordered two tacos: the Achiote Pork and the Chicken Tinga. 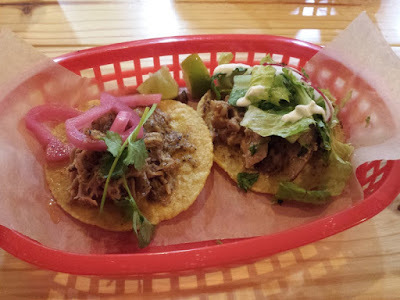 The achiote pork taco consisted of a corn tortilla stuffed with slow roasted pork cooked in banana leaf, achiote, pickled onion, cilantro, and habanero salsa. The chicken tinga was also served on a corn tortilla filled with pulled roasted chicken, chipotle chile-tomato sauce, lettuce, and crema fresca. Of the two tacos, I preferred the Achiote Pork. The meat was nice and tender and pickled onions were a nice touch. I wasn't a big fan of the chicken tinga. The chicken was a bit chewy and the lettuce and sour cream were spilling out of the tortilla before I even tried picking up the taco. The tacos also could have been improved if they used double layered tortillas. The single corn tortilla got soggy and was starting to rip as I was eating the tacos. A second tortilla would have helped. Another improvement for Black Rooster in general would have been to put orders on the correct plates. We had ordered multiple achiote pork tacos. They all were served together with other wrong taco combinations on other plates. Actually putting tacos together as they were ordered would have saved some messy rearranging. 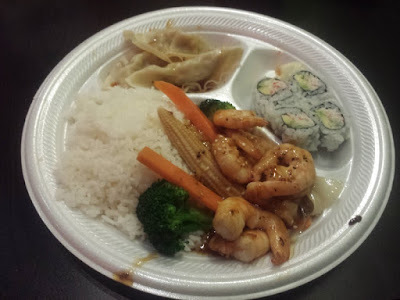 I ventured to Deland and had dinner at a restaurant called Fuji Express. This fast food Japanese restaurant served both hibachi style food as well as sushi. There were other people eating there, but I don't know if I'd trust this restaurant with raw fish. I ordered the Shrimp Teriyaki Bento Box. The shrimp was cooked with carrots, baby corn, and broccoli in teriyaki sauce. It was served with California rolls, goyza, and steamed rice. Everything tasted adequate enough. None of it was outstanding, but nothing was bad either. I wouldn't rush back here for fast food Japanese food, but wouldn't necessarily object if someone suggested eating at Fuji Express again.